The world is a globe right? Or maybe not....bizarrely despite years of scientific evidence and photographs to the contrary there are still a few who believe that the Earth is in fact flat. 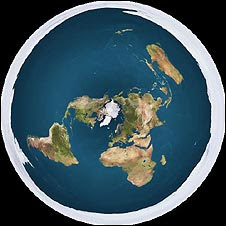 Dismissing satellite photos showing a spherical world as fakes, part of an international space agency conspiracy to dupe the general public for profit, "Flat Earthers" believe that the world is in fact disc shaped. There are no reported incidents of ships falling off the edge as circumnavigation occurs as a broad circle across the surface of this disc and besides, Antarctica is thought to occupy the entire circumference of the Earth. We'll let you make up your own minds but we remain unconvinced! Probably the best flip flops in the world!